What is a custom made foot orthotic? A custom made foot orthotic is a corrective device worn inside your shoe. It can help the muscles, tendons and bones of your feet and lower legs function at their highest potential. 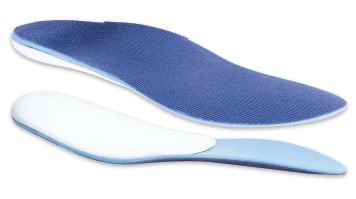 Custom made orthotics are manufactured from a 3-D image of your foot using raw materials. When appropriately prescribed to treat a medical condition, custom made orthotics can decrease pain, not only in your feet, but in other parts of the body, such as your knees, hips and lower back. Orthotics are prescribed by medical practitioners who will carry out a full biomechanical examination of your feet and related lower extremity, including gait patterns, and measurements. These medically prescribed devices are to be worn daily in accordance to the attending practitioner’s specific instructions. 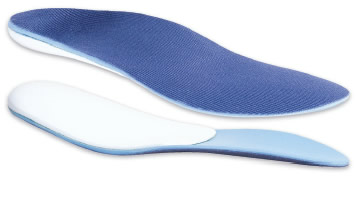 How do custom made orthotics work? Will custom made orthotics change my anatomy permanently? Custom made orthotics will not permanently change your anatomy and will function only when you are standing or walking on them. Orthotics are commonly used to relieve symptoms of common injuries, such as plantar fasciitis, metatarsalgia, neuromas, back issues, overpronation (see below), oversupination (see below), and various foot and ankle tendon injuries. Custom orthotics also help individuals with diabetes or arthritis. It is important to note that custom orthotics complement other treatments such as chiropractic, stretching, icing, heat therapy and massage. Overpronation is often recognized as a rolling in of the foot. Excessive inward roll of the foot after landing, enables the foot to continue to roll when it should be pushing off. This rolling motion actually twists the foot, shin and knee which can add strain and thus pain to these areas. If you are an overpronator, you will find more wear on the inner side of your shoes. Knock knees or flat feet contribute to overpronation. To learn more about oversupination, please watch the following video. 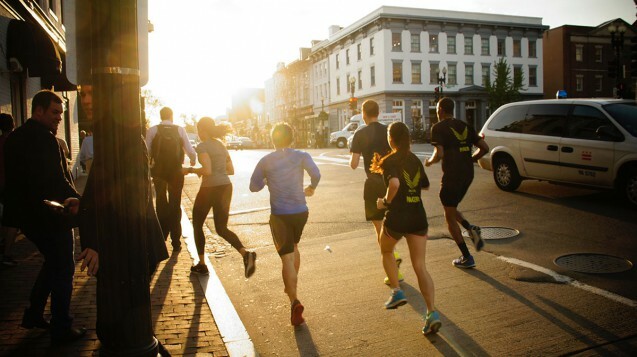 What is oversupination or underpronation? 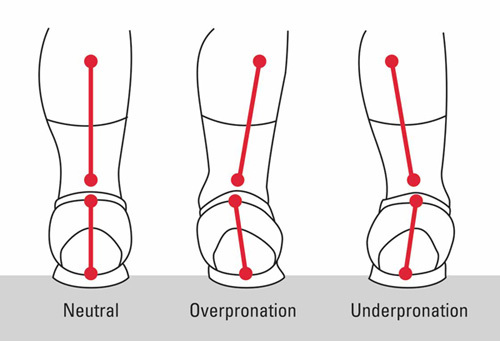 Oversupination or underpronation is when the outside of the heel makes initial contact with the ground. This type of inward movement of the foot occurs at less than fifteen percent of the population. In the push-off phase, most of the work is done by the smaller toes on the outside of the foot. As a result, you will see more wear on the outside of the shoes. To learn more about overpronation, please watch the following video. 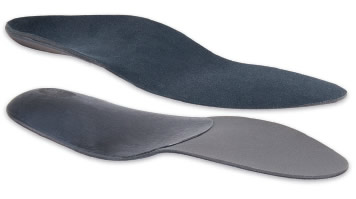 What types of custom made orthotics are available? Specifically constructed to meet the needs of patients who require increased motion control in a lightweight resilient device. Fits most athletic footwear types. For Him, or Her, low profile device for use in slip-on or lace dress shoes, designed to promote enhanced biomechanical control with reduced bulk. Soft EVA shell, designed to provide soft cushioning and enhanced support. Ideal device for sensitive clients who require gentle support. Full fitting casual footwear suggested. Not recommended for dress or athletic footwear due to bulk and design. Constructed utilizing a semi-flexible shell design to provide motion control and comfort for children. Suited for athletic footwear and casual day to day youth footwear. Designed to provide high levels of control with design features allowing maximum shock absorption. Best suited for casual, workplace and active footwear which allow depth for device. How will you cast my foot? We make our custom foot impressions using a foam box. The foam box technique involves pushing the foot into a foam box while the patient is in a semi-weight bearing position (sitting). This technique often used if someone cannot get on a table for plaster casting or if a less aggressive shell shape is desired. Our Chiropodist also uses a laser technology casting process. Please view the following video to learn more about this casting technique. 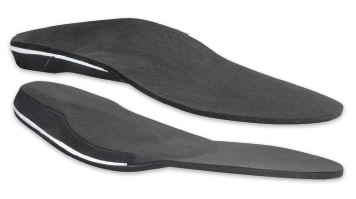 Are orthotics covered by OHIP or extended health insurers? Custom made foot orthotics are not covered by OHIP, however, you may be covered through your extended health insurance plan. You made need to call your insurance company in regards to the amount covered. Your extended health insurer may require you to provide them with a biomechanical gait analysis as well as additional paperwork indicating the orthotic raw materials and building technique. Set Up a Complimentary Custom Foot Orthotic Consultation Today.